OK, so cuddle parties are so fake-2004-trend, but tree huggers are going to get niiiice and cozy with the cherry trees at the Jefferson Memorial this Saturday, Oct. 17 from noon to 3 p.m. The National Capital Tree Hugger Day will feature an appearance by the "beloved" Treeture Blossom (um, we have no idea), folk and bluegrass tunes, naturalist-led tree walks and a heart-warming Group Tree Hug around a grove of cherry trees on the Tidal Basin. 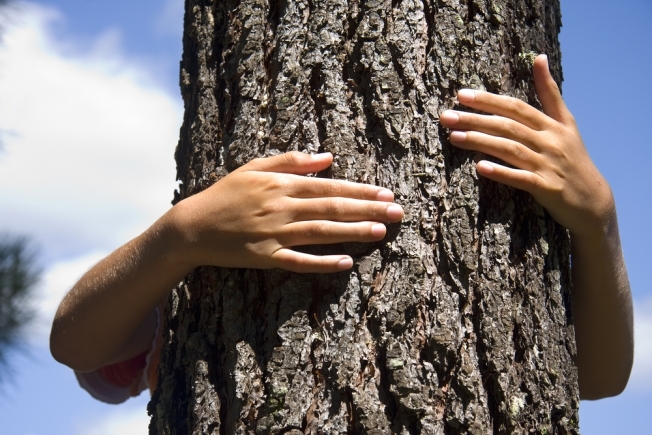 Aww, the trees will feel your love, which will be enough to keep them cozy all winter long! Expect some glorious tree swag, including baby trees to take home for planting, tree books, Tree Hugger portraits, T-shirts and buttons. This is where we could say something like the best thing for trees would be to NOT give out all this unnecessary merch that will probably end up in a landfill, but that would just make us sound like poor sports, so we won't. Meanwhile, the planners are also sponsoring a Tree Hugger Day photo contest. Categories include biggest hug, oldest and youngest hug, and strangest hug. We Love D.C. finds the category for "Strangest Hug" a little creepy, but as long as the winner isn't the Georgetown Cuddler, we're cool with it.